Plentiful Hot Water, Powered by the Sun! Roofmax is one of the Bay Area’s leading installers of Solar Hot Water Heating Systems, an environmentally friendly, energy efficient way to ensure your family has plenty of hot water, heated by the sun! Using solar energy to heat the water in your home can reduce your monthly water heating bill by 50% – 80%. All while helping to preserve precious natural resources. Plus, Federal tax credits could help pay up to 30% of the cost of your system. Using the sun’s limitless energy to heat water for home or commercial use is not a new concept. But today’s modern technology has brought the power of the sun to home use more efficiently than ever. Solar water heaters are an environmentally sound way to reduce energy bills, and to help protect the environment. The hot water demands of your home and family can consume a significant amount of heating fuel, even when your hot water heater is in “passive” mode. Just listen to how often your water heater “kicks in” to maintain hot water that may not be used for hours, if at all. That is energy wasted and money out of your pocket. 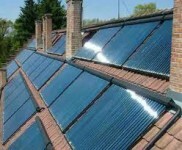 Solar energy can efficiently and effectively meet part or all of your home’s domestic hot water needs. Our solar water heaters mount flush with your home’s roof and resemble skylights. They help maintain water temperature without the constant need for burning heating oil, gas, propane or electricity. Saving money while helping the environment — two outstanding benefits of a solar hot water heating system for your home.